If you've signed up to the newsletter already use this link to signup for your free session. For those of you who've signed up a while back and never received it you can do so now by using the link below. Water has a memory. It can hold onto intentions and programming and it can carry out the instructions given in a similar way as a computer or a thought-form. Using my special energy healing process I've programmed this water with the vibration of healing energies. Wherever on the body I rub the water it transfers the healing energy to that area and makes pain and other symptoms disappear totally with miraculous results similarly but even faster, in some cases, than my energy healing sessions. 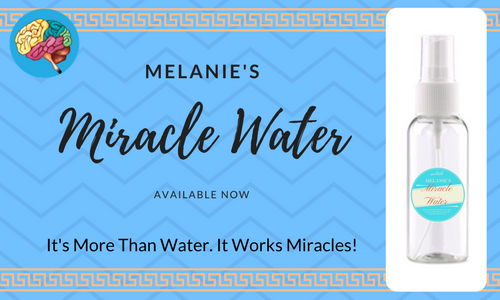 Melanie's Miracle Water is replacing The 'Heal Yourself' Pain Relief Method. The water has mostly the same effects. In fact, I could use that article to describe the miracle water without changing 99.5% of it. Read that article for more information. I'm not sure why but this water works exponentially faster, almost instantly in most cases, than anything I've ever seen. There is no medication I've ever heard of that works as fast. If I had back pain and took Aleve, Ibuprofen, or Tylenol, for example, it would take 30 minutes or longer before it starts working and I don't like waiting that long. I, like you, want instant results. Plus I don't like taking pharmaceutical drugs so I'd rather take something more natural if it works just as well, especially for long term use because it's safer and non habit-forming. Pharmaceutical drugs can damage the organs and the functioning of the body so I try not to use anything if I don't absolutely have to. You can also purchase my energy healing services if you need even more help. Use the water at the same time for even better results. Pains disappear extremely fast, in most cases within about 1-2 minutes if you apply Melanie's Miracle Water at the first signs of pain, much faster than if you wait until the pain is really bad. The pain disappears faster than using medication in every case I've tried it on. Pain disappears TOTALLY Every Time! There is nothing that it hasn't worked on. The effects of the water reaches deep into the body. I'm still testing things as they show up and you should too. Have pain? Have trouble controlling pain? Want to reduce the amount of prescription pain medication you are currently taking? This water is infused with energy healing vibrations and is able to reduce pain with miraculous results. It works on all sorts of pain as well as other issues. Add $10 Extra for Speedy Delivery - will deliver as fast as possible - within 48 hours. Without Speedy Delivery delivery times will be between 3-5 days. Need Help? How to Purchase? After you purchase email me a picture of your water bottle. I will contact you letting you know I've received your order. Allow 3-5 days for the process to be completed or 1-2 days if you choose Speedy Delivery. I will then contact you again to let you know that you can begin using it. Spray Bottle - Spray 1 pump of liquid onto area or into hand, rub it in and allow to air dry. Reapply as needed. Use extra if pain is not going away. Use it before you think pain will return or as soon as you feel pain. The sooner you apply the water to a painful area the sooner the pain will stop. Because it's safer than medication you can use as much as you want as often as you want. Safe for everyone, even pets! 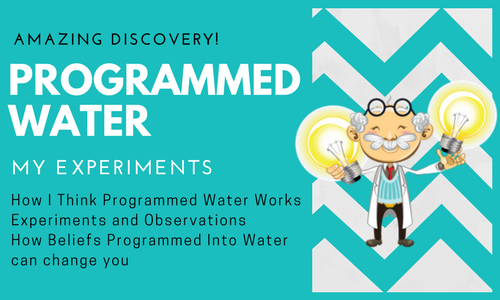 To explain how I believe the water works I created an article entitled, Programmed Water - My Experiments. If you want the quick version read this part and this part. Honestly, I was excited to test this one. I really didn't think it was going to work all that well, well I wasn't sure so I knew this would be the ultimate test. And, of course, the best way to find out is to try it. The pain started late at night and I was just about to get ready for bed. So when I first felt the cramping and pain I didn't apply the miracle water right away because I wanted to wait until the pain got worse. When it did out came the miracle water and I rubbed it in on the front side of my body where the uterus is located. I could tell something was happening fairly quickly because there is a feeling I always get whenever I rub the water on my body near the intestines. It's kind of a hard feeling to describe. It's like an energy movement in the intestines. I get the same feeling every time I rub the water on my lower back. After about 2 minutes the pain didn't seem like it had lessened any really so I rubbed a few more drops on the same area and again I waited. At this point I was about to get out the Aleve but then something happened. The pain began to subside about half way which is not enough so I rubbed in a few more drops. After that, I waited about another 1 or 2 minutes and during that time I noticed the pain subsiding more and more until it finally disappeared. Since the pain was so bad it looks like it needed extra drops and a bit more time to kick in. I didn't have any pain for the rest of the night but I put some more on anyway when I got up to use the bathroom a few hours later just in case. I continued to test the effects of the Miracle Water the next day and the day after that. I noticed that whenever the pain subsided the other symptoms subsided too which means it also got rid of the exhaustion and weakness I usually get with the pain and cramping. Whenever I felt a twinge like the pain was about to start up I put some Miracle Water on it and again it went away almost instantly (in less than 30 seconds) and the pain did not return for several hours. Remember, I never took any pain pills during (or after) this test or any other test listed on this page which proves this water works miracles. I cut the underside of my toe. I put a BandAid around the toe first because it was bleeding a little. I thought it felt fine at first but then it started aching and annoying me. So out came the Miracle Water. I didn't put the miracle water directly on the cut. I wanted to test what would happen if I rubbed it in the skin near the cut so I rubbed it on the opposite side, the top side of the toe over the bandage. Again, I wasn't sure what would happen so I waited. I began doing something else and when I remembered to check on it I noticed the pain was totally gone and it never came back. This shows that the effects of the water reaches deep into the body. My mom had a pain that she described as being "so bad that it felt like my leg was going to fall off." She said she was doing a lot of moving around at work that day. She put the water on the area that hurt and it disappeared within a few minutes. I put it on my dog sometimes. She seems to be fine and happy so I didn't notice anything different about her but I want to keep her happy and healthy so I'm just going to put it on her once per day. Try it on your pets. Anyone who wants the benefits of the healing energies. Anyone who has pain. Use it in place of painkillers in most cases. Use it with painkillers for more severe pain. Can help you to use less prescription medications. Buy a 2oz spray bottle from Walmart or a grocery store. Should cost about $1. Sanitize it by washing it in hot water or carefully boil it. Fill it with clear spring water. Take a picture of it and email the picture to me after you purchase. You will purchase a 2oz spray bottle from the cosmetic department or in the travel (sized) item section of a store like Walmart, Walgreens or at a grocery store. You may take the label off of the bottle (if you can; but don't throw the label away; the label on Walmart's Equate bottles peel off really easily) before you wash it with hot soapy water or by carefully boiling it. After cleaning, fill it with spring drinking water and put the label back on. (The point of keeping the label on it is to make sure you have the right sized bottle.) Purchase using one of the links above and email me the pictures. I am not shipping the water at this time. This service includes distant energy healing on your bottle of water. In this article I will explain how I think programming water works based on my own personal experiments and observations. You will learn about the vibration of water, how beliefs and intentions can be programmed into water and how it has the power to affect the person who ingests it. You will also learn a little about a special water experiment I've created that's having miraculous results. I've created programmed water called Melanie's Miracle Water and you will find out how it is totally removing all sorts of pain and itchiness from the body and is replacing the need, either partially or totally, of pharmaceutical drugs. Everything is made of energy and energy vibrates so everything vibrates. Every part of life has a different vibration. Water from different sources has different vibrations and every substance, plant, animal and human has a different vibration. Even every organ in the human body has a different vibration. People, thoughts and ideas can be said to have a high vibration or a low vibration. For example, love and loving thoughts have a very high vibration and hate and hateful thoughts have a very low vibration. Gratitude and compassion has a high vibration and selfishness has a low vibration. "Energy healing" has a high vibration because it comes from a place of love and compassion. The objective of energy healing is to help others and so it comes from the heart which is another way of saying it comes from a place of love. The vibration of anything can be changed. For example, when a sound vibrates at the right pitch it can change the vibration of a glass which causes the glass to break. And here is another interesting video that shows how frequency affects vibrating water. It's amazing the way the vibration causes the water to form geometric shapes. An example of water that has been changed in vibration is holy water. Holy Water is used by Catholic Priests during exorcisms. The priest prays over the water giving it a very high vibration that negative entities don't like. Negative entities enjoy and thrive in low vibration settings so being in a church or being touched by holy water would be painful for them. Nothing has changed about the water except the vibration. The vibration of water can be changed easily, with a thought or an idea written on a piece of paper, with prayer or just by playing music with water sitting near the speakers, as in Dr. Emoto’s experiments, and because of this any belief can be programmed into water and the water will hold the vibration of that belief. If you drink that water the vibration is then transferred to your cells and to your mind. What affects your body affects your mind because body and mind are intimately linked. The majority of medical doctors, psychiatric professionals and probably most scientists like to treat either the body only or the mind only, neglecting the other aspect of a human being. Because they treat the body and mind separately and not holistically (together as a whole) they have very slow results. Energy healing by an "energy healer" affects all parts of the person to treat both the body and mind for better results. An energy healer can focus the healing energies directly to a specific area of the body or to the whole of the body and the energy also affects the mind. When I do pain energy healing (or any energy healing) for people it may seem like I'm only working on the body but I am certainly working on both body and mind because to affect one is to affect the other. The belief and vibration, in the case of Melanie's Miracle Water, for example, consists of energy healing of pain and infection and it affects both the body and mind. Once the belief is infused into the molecules of the water it acts in basically the same way that energy healing works. I programmed Melanie's Miracle Water with the vibration of healing energies. In some cases it seems to affect the body of the user the same or better than when I do distant energy healing. Maybe the healing energies are a bit more concentrated in the water because the water molecules hold onto the belief and vibration much stronger. When the water is rubbed into an area it is absorbed directly by the body's pores as well as the person's energy body, transferring the properties - the vibration and belief - directly into the area. It doesn't seem to affect just the body though. It seems to also affect the mind and these are some reasons why I think it has such miraculous results - by working holistically for the person using it. I used to program beliefs into water for my customers and after drinking the programmed water for just a few days they found the belief becoming stronger and stronger and more a part of their lives with each subsequent glass and bottle of programmed water. I don't do it anymore because I've created The Rapid Psychological Reprogramming Sessions that helps you to install almost any belief into your body and mind. I will likely make some other special waters programmed for different purposes in the future so please make sure you check back periodically. You can also sign up to my newsletter to make sure you receive an email with important updates. Water programmed with a belief takes in the information and in some way it is able to transfer the belief to the person who drinks it or applies it to their body. What I believe happens is this... The thought or idea programmed into the water has its own vibration and because of the loving energy healing it is given an even higher vibration. After the programmed water with a higher vibration is ingested, or rubbed on the body in the case of Melanie's Miracle Water, it has a stronger affect on the water, molecules, cells, tissues, etc. of the body (and energy body) and has the result of raising the vibration of the water, molecules, cells, tissues, etc. of the body (and energy body) to match very closely the vibration of the energized/programmed water. In the case of programmed water that has been ingested, this is how the belief becomes a part of you. Your physical, emotional, mental and energy body is now changed to match the vibration of the belief programmed into the water. In this way using water is a great way to change your beliefs among other uses such as for reduction of pain and other symptoms which is what Melanie's Miracle Water is specifically created for. The amazing part about programmed water is that it is able to help you make changes by bypassing the conscious mind directly, just like The Rapid Psychological Reprogramming Sessions I created. The fastest ways to make subconscious changes are by using methods that bypass the conscious mind with the least amount of resistance. You want to impress your subconscious mind with an intention but in the normal waking state the conscious mind can block any intention from making it through like a brick wall. That is why methods like meditation are recommended. If you are able to reach the proper level of meditation where you get to the point where the conscious, thinking mind slows and quiets down enough you can send your intention directly to your subconscious mind so it can make those changes. Getting your intentions to your subconscious mind is the key to making lasting personal mental (and subsequently physical) changes. An intention placed in water, or with a powerful method like The Rapid Psychological Reprogramming Sessions, bypasses your conscious mind's brick wall and sends the intention straight to your subconscious mind. This is why it works so well. It basically takes the conscious mind out of the equation. The most common methods used to change subconscious beliefs are visualization with meditation but I think most people have trouble with it. For most people it takes many months to learn to quiet the mind long enough to meditate and then to correctly visualize the scenes needed to create changes. Some people can't sit still long enough to follow through with the process of meditation to completion. Others may quit too soon because they may believe it's not working, they feel like it's too slow, it's boring or they don't have time because of a busy schedule. If you want fast results with not a lot of work then programmed water or The Rapid Psychological Reprogramming Sessions are the way to go. Drinking programmed water to bypass the conscious mind and directly make changes to the subconscious mind is one of the easiest ways to create changes for anyone who is willing to give it a try. The only trouble is that it's not that easy to get your hands on programmed water. The Rapid Psychological Reprogramming Sessions is another one of the best, easiest, and fastest ways to make changes - change beliefs, change your personality, and more - and it's much more readily available so I would say that makes it the first best way. The Nutrient Support Supplement Session is an automatic energy session that helps the body have all the nutrients it needs. The main basic elements, including Hydrogen, Oxygen, Carbon, Nitrogen, etc., are the building blocks of your body and are used by the body to sustain the body and all of its functions and systems. These elements are used by the body in a miraculous way to keep you alive. When your body lacks the necessary vitamins and minerals, proteins, neurotransmitters, fatty acids, etc., which are all available in their particular form because of their molecular structure (how the molecules bond together to make a particular vitamin like Vitamin A, for example), it does not function correctly leading to many diseases, mental and physical. When your body is lacking a certain level of neurotransmitters secreted by the brain, for example, it can lead to depression, weight gain, and much more. The same goes for the other nutrients your body needs. 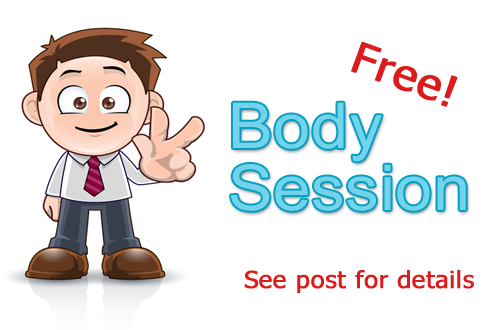 Want to get this session free? More details can be found at the bottom of this page. Too low levels of several nutrients can cause you so many problems and it is hard to know what you need to eat more of or less of in order to support your health in the best way. It would be hard to always eat the right nutrients in the correct amount so this session helps to support you by giving you all the nutrients your body needs. Because this automatic energy session is energetic it does not have the same side effects as if you took the real life chemical equivalent of any supplement or man-made manufactured and processed products. You cannot overdose or make yourself sick if you run this session a long time, for example, when using this or any of the other sessions on this website. This session helps to safely change the molecular structure of your food and excess elements within your body into all the different nutrients your body and mind needs to become more balanced and sustain a healthy body. This session takes the molecules from the water you drink and the food you eat and changes it to create the nutrients your body needs to function properly. It certainly helps to make sure you are eating healthily but you do not need to become a health food fanatic while you're using this session. This body automatic energy healing session will help to create for you a more nourished body by adding nutrients to your body. Today's diets are lacking lots of nutrients and in many cases you are not getting certain nutrients at all. This session helps your body to create nutrients that are missing or lacking from your body by reassembling the nutrients you are supplying it from the food you eat. All the processes of the body will begin to work more harmoniously. I've added a number of vital nutrients and more that help to sustain and support the healthy functioning of your body. That includes lots of vitamins, minerals, essential and non-essential amino acids, proteins, anti-oxidants, fatty acids, phytochemicals, enzymes, neurotransmitters, hormones, and more. Along with proper nutritious meals this session should help you to feel better daily. You do not need to eat super healthy meals but of course the healthier the better. I try to use this session myself daily and I can certainly notice a difference on the days I don't use it. Actually, I usually notice it maybe 2-3 days after I've stopped using it. 2. Subscribe to my newsletter and receive it for free (For a Limited Time). 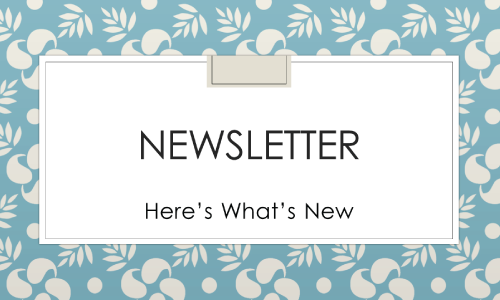 If you are already subscribed to my newsletter you will receive access soon. Learn how water has a memory and because your body is made of 70% water what this means for you and your health. 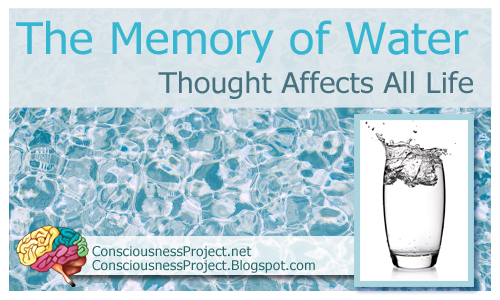 Did you know that water has a memory and is affected by thoughts and ideas? Dr. Masaru Emoto, a leading researcher and author of several books on the memory of water, has done extensive research on how words, music and prayer changes the form of water. He created simple experiments where he would write a word or phrase on bottles of water. After letting the water sit for a while he would take a drop of the water and freeze it to make a water crystal. Then he took photographs of the water crystals under a high powered microscope. The pictures showed that loving and caring words, such as “Thank you,” formed beautiful water crystals and negative words, such as “You fool,” formed malformed and ugly shapes that didn’t look like crystals at all. View pictures here and here. If taking pictures of water was the only way to test what kind of water we were about to drink this would be a very good way to tell the quality of water. The information in the photographs paint a picture about where the water has been and how it has been treated. The same results were found with music. Classical music produced beautiful water crystals and heavy metal music produced ugly images. This is visual proof that water is affected by words, thoughts, ideas and sounds. In fact, all of life is affected in the same way. Not just human but animal, plant and lower forms of life as well. The images presented in the first video below are actual photographs of crystalized water after being exposed to positive and negative words. This is proof that water can carry information and that it indeed does have memory. This second video is a short clip from the movie “What The Bleep Do We Know.” This video includes the ugly images of the waters from Japan's Fugiwara Dam before and the beautiful crystal that formed after being prayed over by a Zen Buddhist monk. It also includes images of distilled water before and after. The following experiments demonstrate how different forms of life are affected by thought. Cleve Baxter, a polygraph specialist and former expert for the CIA, did a series of experiments in the 1960s on different forms of life where he shows how human intention affects life. To test this theory an experiment was conducted by attaching a plant to a polygraph machine. Baxter would think about burning a leaf and the needle on the polygraph would jump showing the plant’s reaction to this thought but more interestingly the plant only reacted when Baxter actually intended to burn the leaf and not when he pretended to. The plant seemed to read his true thoughts and emotions and not weak fantasy imaginings. Needless to say, the plant reacted as well when the plant was actually burned. Mythbusters, a show which aired on The Discovery Channel, recreates Baxter's plant experiment as shown in the video below. They explain how a polygraph works in detail and shows the “emotional” reaction of the different experiments, or assaults, on a plant. Near the end of this video one of the men imagines burning the plant using strong emotion and the plant reacts with a big spike on the polygraph. Baxter has conducted other experiments such as one with bacteria in yogurt. In the video below he separates the yogurt culture, putting some in a beaker and some in a test tube connected to the polygraph machine. The bacteria in both the beaker and the test tube has a connection to each other so when Baxter adds milk to the beaker within a few seconds the bacteria in the test tube seems to detect something going on and the polygraph needle begins to jump in reaction to it. This simple test shows that both samples of bacteria are connected in some way because when something happens to one sample the other sample experiences a reaction. Bacteria is a form of life and like the plant and all other life it responds to outside stimuli whether it is being affected directly or indirectly. Whether or not you believe that the plant or bacteria has emotions, psychic abilities or extra sensory perception (ESP) something is definitely happening with the plant and the bacteria culture as shown in the three videos above. You can call it an emotional, psychic or energetic reaction if you like but no matter what you call it these living things are able to sense something is going on and is being affected by it. The most interesting part about these experiments is the fact that all life reacts to thoughts. This is how energy healing works. The "healer" makes a strong psychic and energetic connection with another person, or whatever he or she is trying to affect with the energy healing such as an animal, plant, bacteria or water. Once a strong connection is made the person initiating the energetic connection, i.e. the “healer,” can more easily create change in the emotional, mental and physical body of the person he/she is trying to affect. You can create a strong psychic and energetic connection with someone just by thinking about them intently. The more intense the thought or emotion the more connected you are with that person. Sometimes the greater the connection that is made the more the other person can feel it. For example, when a person loves another the other person can feel this love. The stronger this feeling of love is the better the other person can feel it. The same happens with anger. You can feel when someone is angry even if you have your back turned to them and you didn’t know they were there. You may begin to feel weird and your mood changes as a subconscious response to the strong emotions that are being sent to you psychically and energetically. You are reacting to their thoughts and emotions. This is the same phenomena that happens when you feel like someone is watching you. To people who are more sensitive and who can feel these energies more easily it can cause an uneasy feeling that may make you feel self-conscious and it can even make you feel dirty. In the first two videos in the section above the man creates a strong psychic and energetic connection with the plant just by intently thinking about it (about burning it) and it creates a reaction in the plant as shown by the jumps of the needle on the polygraph machine. The stronger the psychic and energetic connection an energy healer can create between healer and healee (the person being healed) the better a connection is made, but the better an energy healer is at energy healing the connection is multiplied and so he/she does not have to use as much focus or energy as someone who is just starting to do energy healing. For example, I do a lot of energy healing and I expend a lot less energy now that I’ve been doing it for so long than when I first started. Basically, it becomes more effortless. In fact, I can connect strongly mentally, psychically and energetically with anyone and anything just by slightly thinking about the person or thing. When I first started out I had to use a lot more energy and mental effort. I realized this because results took longer back then to manifest than it does now. Your body is made of over 70% water. In fact, each cell of your body is made mostly of water and your body is composed of trillions of cells. The water in your body holds information and memories just like the water in Dr. Masaru Emoto’s water crystals. The physical body, and all of its cells, are affected in the same ways as the plant and bacteria in the experiments spoken about previously. Just think if you are looking at pictures, watching movies, reading articles or books and listening to certain kinds of music as demonstrated in the images of the water crystals on Dr. Emoto's website and in his books. The same thing is happening within you. If the images, etc., are hateful or negative in nature your body's water is being affected in a negative way. If the images, etc., are loving and beneficial in nature then your body is being affected in a positive way. The art that you place in your home is, for most people, pleasing and of a positive nature. You choose certain images and scenery because it makes you feel good. When you are sitting in a room of your home with positive images surrounding you they are having a beneficial effect on your body. If the art you choose to place in your home is chaotic in nature you just may be affecting yourself negatively. So choose wisely what kinds of images you place around you. Speaking negatively to yourself and surrounding yourself with negative images, thoughts or ideas damages the water in your cells and subsequently damages the functioning of your cells, organs and your body's systems and causes a negative impact on your health. If your body’s water can hold memories and information you may want to be careful about the people who you choose to spend your time with. What affect are they having on your body’s water? People who are happy, with good vibes and who say nice things are much better for the health of your body than negative people who are always complaining and bringing you down. Remember the pictures of the water crystals at the beginning of this article? Which kind of water would you rather drink? The beautifully formed water or the malformed, ugly, toxic-looking water. Most of the water used in Dr. Emoto's experiments was clean, distilled water, which is said to be pure water. You wouldn't think that water would look different after being shown certain words or pictures, or when certain music is being played nearby. When I first found this information I was amazed. As a side note, on this page of pictures by Dr. Emoto there is a photograph of water that was shown a picture of an elephant. I find it particularly interesting because elephants are my favorite animal and the image is so beautiful I am kind of surprised how beautiful it is. I wonder what the water crystals of other animals look like. Some people believe water is water no matter where it comes from but I believe the water that forms beautiful water crystals is better because it is in a better state of health. In the same way you wouldn’t want to eat an animal that is sick you don’t want to drink sick water. And if the picture of the water looks sick I would rather not drink it - if I had a choice, that is. Personally, I would rather drink, beautiful water. I would also like to add how important water is to the body. If you do not drink enough actual water, not liquids that contain water such as sodas, you become susceptible to all sorts of conditions and illnesses because the cells of the body need clean, colorless water to be able to carry out all of the body’s different functions. And the better the condition, i.e. health, of the water the better the water is for you. That's why a nice spring water is better for you than tap water. Not just because it's not coming out of dirty pipes but because spring water comes from (or it is supposed to) a natural source that mother earth prepares for you. There is certainly a lot more I could say about what is negatively affecting your body such as cigarettes and sugar but I would have to write another article because this one is getting too long. What I will say is that just placing cigarettes and sugar next to the body, without ingesting it, causes the body to have a negative reaction that you may not necessarily feel. Only people who are extremely sensitive to the energies of the body will notice it but the majority of people do not. When you have time I recommend you watch this fascinating video. Water really is amazing. This video is a longer look at water and how it has memory. It explains in detail how water holds memory from a scientific standpoint. 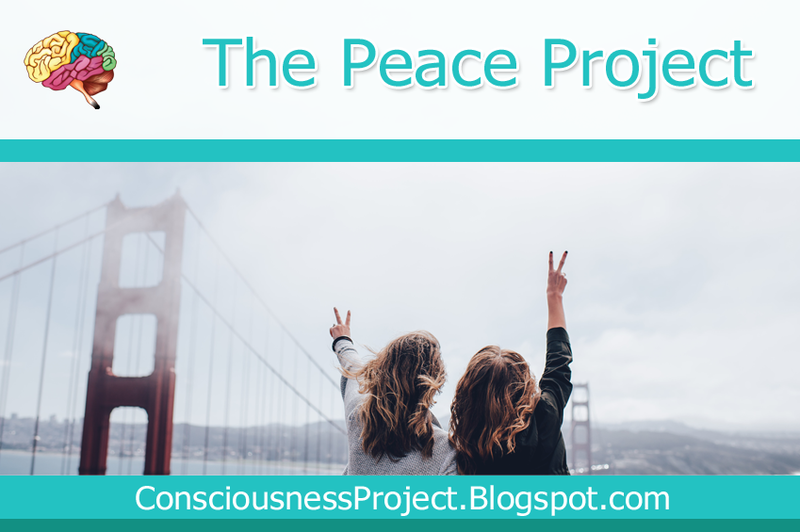 The Peace Project was created with the objective of helping more people to receive more peace in their lives and to help manifest more of their wishes. It will help you to resolve problems faster and attract to you better circumstances. See a longer list of possible benefits below. Find out how you can receive access to The Peace Project below as well. How does it work? This special technique, based on a special prayer, was created with two purposes in mind. The first purpose is to bring you more good luck and to manifest more of your personal desires. The second purpose is to begin healing negative memories and negative energy from memories held within the subconscious mind. It may not heal all your memories right away but the longer you stay subscribed to the service the more memories it will affect. It will begin to clear away negative thoughts that are keeping you from attaining certain goals. For example, you may have negative beliefs about money and so you have trouble attracting or keeping money. Maybe something seems to always go wrong every time you receive money like some unexpected event happens, like unexpected car repairs are needed or something breaks and you have to replace it, and so you have to spend money that you were going to save or use for something else. Your negative subconscious beliefs and thoughts are causing these negative situations to be attracted to you. Because of these negative subconscious beliefs and thoughts negative situations may show up in several areas of your life as mental, emotional, physical, spiritual, relational and financial problems, in your life and in the lives of those close to you (family and friends) and in business, work, etc. By clearing away these beliefs and thoughts you begin to attract better situations into your life. You can read more about how thoughts and beliefs affect you by reading this article I wrote entitled Clear Negative Energy and Emotions from Your Aura. What you can expect from The Peace Program? Problems should begin to be resolved, in many cases, effortlessly. You may notice some changes right away and other changes may happen but you don't realize it until you think back at how the situation played out or after some time of reflection. Sometimes we don't see a situation clearly at the time it is happening and it takes reflection to begin to see things from a different angle. And when this happens we usually notice that things actually happened the way it should have or it happened in a way we couldn't have imagined was actually good for us at the time. It may have even seemed bad at the time it was happening. An example is that you may have wanted something but didn't get it and so you are upset. Then later you realized that you received something even better maybe in a way that you had not considered as an option. You may notice more things working out in your favor. Happier thoughts, a calmer mood and a calmer mind. Things that bothered you before may not bother you as much anymore. You may find that your health is getting better. You may receive creative ideas or Inspiration to take a certain action that helps you get the things you want, that helps to move you closer towards your goals. More business, better pay, better work circumstances, etc. Plus more surprises that just kind of happen. Just as clarification it has nothing to do with magick or anything like that. It is strictly a prayer on your behalf. You don't need to do anything in particular to gain these benefits although I have noticed that things I've been thinking of that I would like to change are coming to fruition. I've noticed several things, some small and some large, that I've been contemplating off and on have come true, at the rate of at least 1 success per day, and others I can see movement towards the direction of achievement of a particular larger goal. One user noticed a slowing down of thoughts... less bombardment of thoughts. You know those distracting thoughts that just keep popping up into your awareness sometimes without ceasing to the point where you sometimes feel like you don't have control of your own mind. If you do have this effect (please let me know) it is a sure sign that something wonderful is happening, peace is happening. If you are subscribed to the Manifestation Machine already you may find more of your wishes coming true. If you are not subscribed you can do so by purchasing here, on The Manifestation Paper Radionics Machine page. Here is the quick link to purchase. My mom had the inspiration, during the very first week I started these prayers for her, to try a shortcut that came to her out of the blue that would help her fill out some forms for work faster making her job A Whole Lot less stressful. Part of her job is to fill out forms for some people in her group. She has to fill out a special form with different information each time and she usually has 2-5 requests from her group per day. They usually send her incomplete information so she has to take extra time out of her already busy work schedule to stop and do this tedious work that usually takes 15 minutes to do on average (but up to 30 minutes sometimes) for each one so she gets bogged down with all this extra work and she gets more and more behind on all the other stuff she has to do. So this week she had the inspiration to try something new so that the form would populate with a bunch of information that she used to have to type out by hand. She finally found a shortcut after almost 8 years (since she began working with this form in 2009) of filling out this form the long, manual way. So now, instead of taking 15 minutes or so it now takes her 5 minutes. She was always complaining, just about every day, about how much she disliked this part of her job so she was extremely delighted as she was telling me this story of her inspiration. I was so very happy for her too because this had been a major stressor of her daily work day. You may or may not notice results right away because it will take time to be able to clear out some of the negative thoughts and beliefs. If you have a lot of stress at work or in the household you may notice improvements but maybe a little more slowly because there is a lot that needs to be cleared. Not just inside of you but inside of the others who you work or live with as well. Some issues may seem to get worse before it gets better because of the time aspect. If you have an issue sometimes it will play out until the clearing begins to take effect. If this happens things should resolve in time. I don't promise that all your issues will resolve and I can't promise how long anything will take. This update is for all current subscribers of any of my subscription services. If you are currently paying $14.99 or more per month for any subscription you will receive this as a bonus. Applies to subscriptions only and not to any healing services unless you are subscribed to a healing service of monthly energy healings that costs $14.99 or more. I'm going to start this service for current subscribers right away (beginning this week). If you don't want me to do this for you just send me a quick email stating that you would not like to be added to The Peace Project. I will be sending out a newsletter and emails letting users know about it soon. If you are not a current subscriber you can purchase any of my subscription services which is any service where you are subscribed to a monthly payment of $14.99 or more. If you want to add other people you know to The Peace Project please contact me to arrange payment. For each extra person, up to 3 people, it will cost an extra $5. For more than 3 people it will cost an extra $10 for each after that. This offer is subject to change. This is a new project that should help you to create even more success in your life. It has been created to specifically bring you more good luck in all areas of your life. I would appreciate any and all feedback on this project. If I don't receive feedback I will not continue this service. Receiving feedback helps me to make this service better. As I receive feedback I will share it with you on my website and on my social media pages. 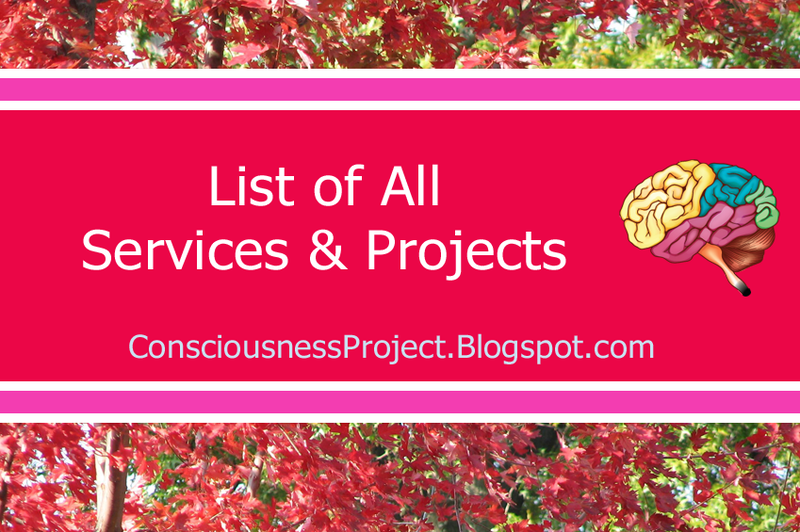 Note: I'm still editing this page to include other services and projects I have available.